Gibson’s E-150/EH-150 amplifiers have long been regarded as the quintessential pre-WWII model, one of the most influential and recognizable amps of all time. 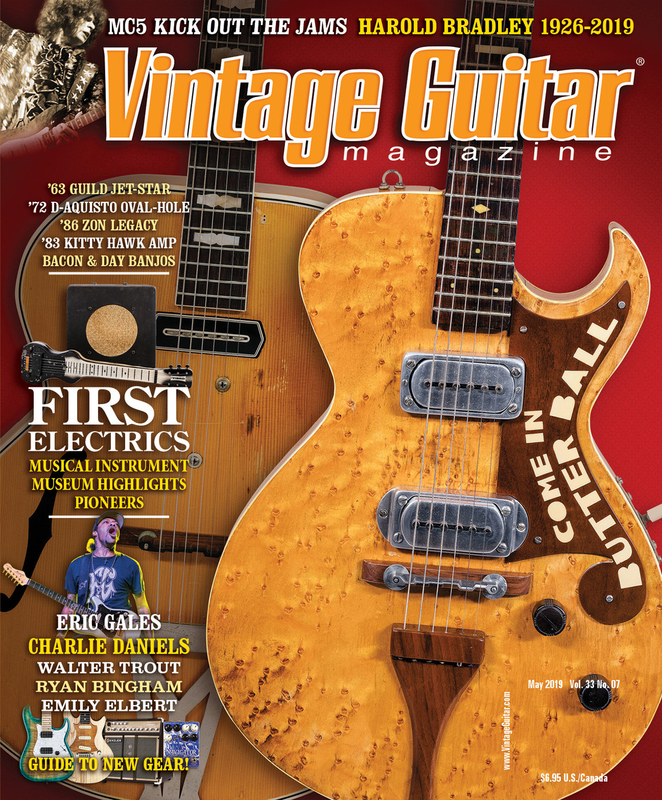 It wasn’t the first amp Gibson marketed for use with an electric guitar (see “Antique Amplifiers” in the September ’97 issue of VG for the first), and it wasn’t originally designed or even manufactured by the highly respected company. But it will forever be associated with the early days of Gibson’s long-running stellar electric line. Electric guitar pioneer and Gibson endorser Alvino Rey worked on the company’s behalf in Chicago in mid 1935, along with engineer John Kutilek of Lyon & Healy, trying to develop an electric Hawaiian guitar and amp set worthy of the Gibson name (VG January ’97). Rey had long been associated with the pre-Rickenbacher brand Electro Frying Pan and amps, which reportedly were role models for the experiments. While Gibson’s first real test run of aluminum-bodied Hawaiian models in late ’35 arguably showed little influence of the Chicago pickup experiments, the four-tube amps that accompanied the instruments had a definite leaning toward Alvino’s personal Electro amp. The first production wood-bodied Hawaiians of early ’36 also came with this simple circuit, but by the end of the year Gibson had an improved model it could call its own. And for the next 30-plus years, they would stay at the forefront of guitar amplifier design, a fact often overshadowed by Fender’s dominance in the vintage market. If nothing else, the beautiful tweed cabinets of the pre-WWII Gibsons set a new standard for design – no more plain black boxes! But more important than cosmetics, the late-’36 Gibson EH-150 stands out as the first amp to pursue the idea of tone manipulation as opposed to merely amplifying what the guitars sent their way. Rey is credited with designing the high-frequency roll-off tone control for guitars, which Gibson introduced to the world on the aluminum Hawaiians. The general idea was incorporated into the amp as a tone switch, to be used in conjunction with the tone pot on the guitars. A second, more practical (for the time, at least) example followed. But while this use had been explored in PA system design for years, the “…beautiful effect” preceded all other “effects.” The idea of intentionally altering the acoustic sound of a guitar – embellishing it – and pursuing a more pleasurable sound cannot be ignored in historical contexts, for the future of Spanish guitar had little room for dry, flat tone. Remember, electric Hawaiian guitars, which inherently produced vibrato-drenched tone, outsold electric Spanish models by as much as 10 to 1 in the pre-effects days. This month we’ll look at four basic versions of the EH-150, which showcase a number of the technological improvements that transpired from the mid ’30s to the start of WWII. These will be referred to here as Styles 1 and 2, having the smaller “square-corner” box with 10″ speakers and Styles 3 and 4 with the “rounded-corner” box housing 12″ speakers (there were actually two slightly different sizes of each box). Closing out the offerings are a couple amps marked “EH-150,” that aren’t! Like all amps of the time, there was no control panel on the chassis of the first E-150s. The power cable, fuse holder (round, house-fuse style on earliest models), on/off switch, pilot light, and two inputs were all secured directly to the backside of the bottom-mounted, bent-metal chassis. A black crinkle paint covered all the exposed surfaces and, like many of the amps of the time, there were no volume or tone controls. Four tubes were laid out similar to Alvino’s Rickenbacher, to the left between the power transformer and the speaker came either a glass 80 or metal 5Z4 rectifier. Twin 6F6s for the power were mounted catty-corner to the right of the speaker with a shielded 6A6 preamp in the front right corner. This triode (actually twin triodes in parallel for Class A operation, as specified in the RCA tube manual) was fed directly by the parallel inputs and was all she wrote in the preamp tube gain department (amplification factor of approximately 35, compared to 100 for the modern 12AX7). The paralleled plates in turn directly fed the phase inverter, with no need for coupling caps. Like many amps of the era, phase inversion for the push/pull outputs was performed by a transformer of the center-tapped secondary type, which stepped up the voltage negligibly while providing equal but opposite signal to the power tubes. This device was mounted to the back wall of the chassis (opposite the inputs), as were the power supply filter caps (two large boxes). Between the front and back panels were the tube sockets, with only a few resistors and caps professionally connected using binding posts, a large grounding strip, and neatly tied wires. Whoever was building these – and it wasn’t the Gibson factory – knew proper assembly techniques (and could have taught Leo Fender a thing or two in his early days). Access to the interior is a breeze, with the chassis secured to the cabinet by a single large bolt from underneath protruding through the metal topside before being capped by a fancy brass nut. Alligator cloth/paper lined the insides of the tweed-covered cabinet as neatly as plaid would line a suitcase of the era, a very pleasing touch. A small label attached to the inside surface of the removable back cover (also lined) had the serial number pencilled in. This number also shows up inside the chassis and on the magnet cover of the speaker. Utah’s respected 10″ field coil model, previously used by Rickenbacher, was standard. This new and vastly improved version was included in Gibson’s Catalog X from very late 1936, along with the brand-spankin’ new ES-150 Electric Spanish Guitar. The company’s reputation apparently needed to be considered, since it took over a year from the release of the metal Hawaiians to the first serious promotion of the electric line. It’s obvious whoever was in charge cared about tonal quality and not merely making the instruments louder, as with the early model. Two independent channels were installed, one with a single microphone input and a second having a pair of instrument inputs. Each channel connected to a separate volume pot, adding much-needed control when using a vocal mic and a guitar or multiple instruments. Other new additions included the extension speaker output jack labeled “Echo Speaker” and the Bass/Normal Tone switch (see above). More power and gain came from two additional tubes and gain stages; a 6C5 triode driver (amplification factor of 20) prior to the phase inverting transformer and a 6N7 twin-triode preamp (amplification factor of 35) with one side for the instrument inputs and the other for the microphone channel, plus a high-mu (amplification factor of 100) 6F5 triode used in the first stage of the microphone channel, compensating for the low-output mics of the time. 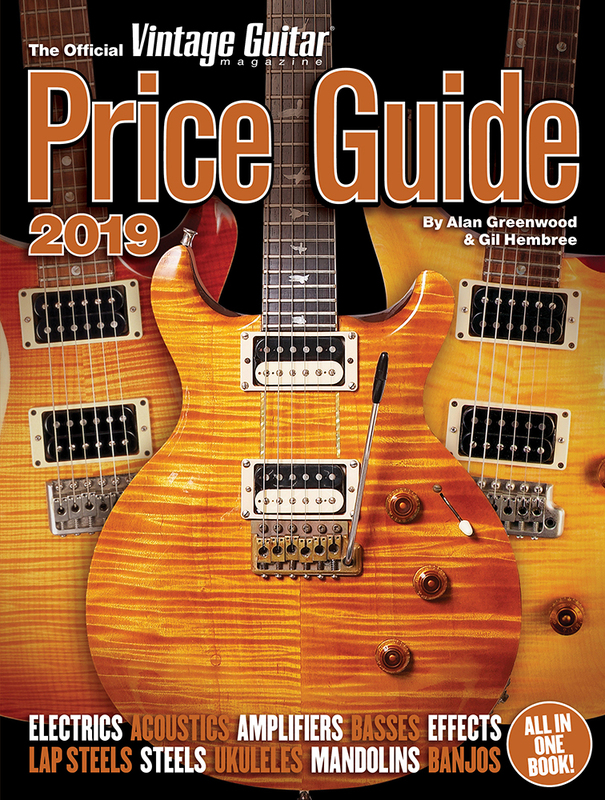 While considered low power by modern standards, the amp Gibson finally decided to promote is not drastically different from today’s amps, and reveals the primitive design of its predecessor in comparison. At $70, it was competitive with the better amps of the day. Another year, another new EH-150 amp – and only $5 more! The tweed case was enlarged and rounded on the left and right top edges, eliminating the need for the top four leather corner protectors (a transition model with the new circuit and the old cabinet has been reported, but these are either really rare or prototypical). Speaker size increased to a 12″ field-coil with the Gibson name on the magnet cover. A beefed up circuit employing seven tubes featured the relatively new 6L6 beam-power variety, in metal. The 5Z3 rectifier, 6C5 driver and 6F5 microphone channel preamp remained from the earlier model, but the twin triode 6N7 was replaced with two 6C5 triodes for the instrument and microphone channels. Power ratings were given for the first time, a respectable 15 watts. It appears this version ran for a number of years, as the picture and basic description from the late-’37 Catalog Y also showed up in catalogs Z from late ’38 and AA from late ’39, plus AA supplements dated October 1, 1940, and May 20, 1941 (shown with the slant pickup on the instrument replacing the Charlie Christian-type of the earlier catalogs). These “What’s New” flyers from ’40 and ’41 replaced the AA electric section, due to rapid changes in that segment of the line. 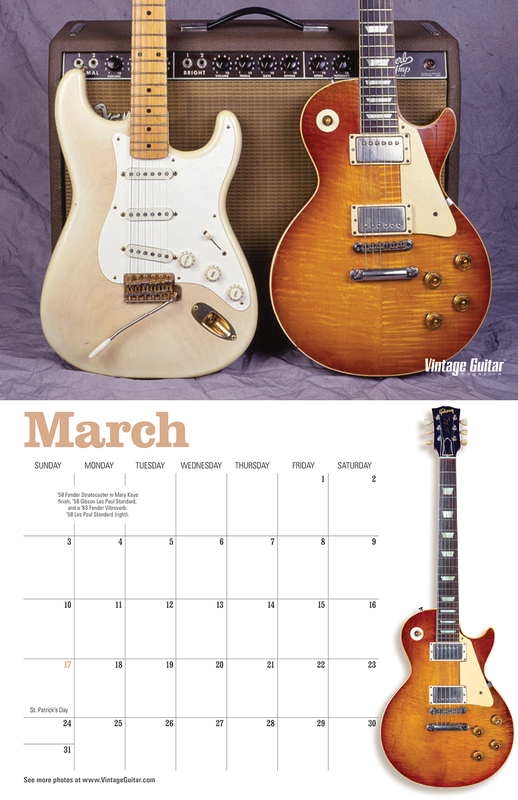 The first supplement showed new or updated artist renderings for the EH-185, 150, and 100 Hawaiians, the EH-100 amp and the ES-150 and 100 Spanish Guitars. 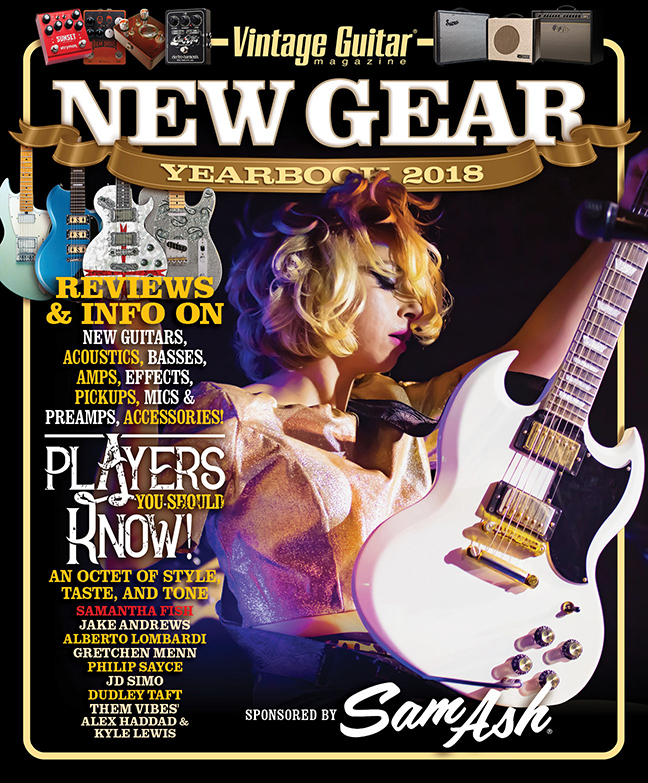 Number two had the second-style ES-300, the new EH-125 Hawaiian/amp set and up-to-date prices, so they appear accurate, although they did not show the change from brown alligator lining to light cream leatherette on the 150. Finally, Catalog BB included the last version of the 150 amp, referred to here as Style 4. Some examples from this era have two labels inside the cabinets – one for Geib, who made guitar and amp cases for Gibson, and a Western Electric licensing agreement granted to Electrical Research Products, Inc., who also made amps for Oahu, Harmony, etc. The final variation showed up in Catalog BB, dated 1942, with a rearranged control panel, having the tone switch replaced by a potentiometer, ranging from Treble at 0 to Bass at 9, with Normal halfway between. The picture was the once-again retouched version of the ’37 catalog’s shot. A major change in the circuit (that may have occurred earlier) was the tube phase inverter, with a twin-triode 6N7 replacing the transformer. Also new were the 5U4 rectifier and the three 6SQ7 high-mu triodes (amplification factor of 100), with two for the microphone channel and the third common to both channels. An interesting placement of tubes on the amp, which was not included in the retouched catalog shot, features the power tubes on either side of the rectifier tube, not standard anywhere else in the world of amps, but somewhat logical. Removal of the tubes to satisfy our curiosity revealed marked sockets from the factory, so this apparently wasn’t the result of repairman monkey business. Sadly, the Echo Speaker output was removed for the final 150, possibly to save money on the center-tapped output transformer previously used. By this time, the EH-150 and the previously supercharged EH-185 shared the same circuit design, right down to the schematic. Some sections of urban America still relied on direct current in the ’30s, and in rural areas DC generators were the only supply of electricity. Gibson tried to accommodate those unfortunate few electric guitarists from these districts (and foreign markets) by offering a “universal-type” power transformerless amp capable of running just about anywhere, sometimes referred to in catalogs as the EH-160. These were offered during the entire run of the 150, but the varieties are beyond the scope of this article. Mention should be made, however, of one that appears in The Tube Amp Book by Aspen Pitman. The 11-tube amp (page 47, Volume 3) is mistakenly noted as using a “…duet of 6L6s” when the four tubes in the back right corner should all be 25B6 power amplifier pentodes. There is a good chance this amp says EH-150 on the control panel (which matches the 150’s panel to a T), but a schematic for what appears to be this exact model, officially labeled EH-160, shows up in an old Gibson amplifier service book. On the far left, in front of a transformer -like device (probably the power supply choke) are four 25Z5 rectifiers. Across the front right are three metal-cased 6C5 triodes, with one driving the phase inverting transformer, a second for the microphone input and a third for the two instrument inputs. The idea of universal-type AC/DC amps had been used previously for radios and would be exploited on student models by numerous guitar companies after WWII. Usually, this type of amp’s heaters are run in series, with their total adding up to approximately 110 volts. Since Gibson wanted the amp to compare favorably to its standard model, they ran a series that included the four 25Z5 rectifiers and one of the 6C5s (106 volts total) in parallel with the four 25B6 power tubes and remaining 6C6s (112 volts – note; the first number in a tube’s designation relates the heater voltage, e.g. 5Y3 uses a five-volt supply, 6L6 uses six-volt, etc.). As to how much current the amp drew or the amount of power it could produce, we’ll have to wait until one turns up in working order. Another amp that gets confused with the 150 was the early version of the EH-185, Gibson’s high-end addition to the line, with removable chassis and flip-top ported cabinet. It seems many of these were fitted with control panels marked EH-150 (albeit often scratched out, as seen later on wooden Fender Pros with Model 26 panels). It’s possible Gibson planned on revising the 150 combo, but decided to leave it untouched, and instead used the ideas for an improved, all-new (and more expensive) model. So the $75 150 combo remained and the piggyback 185 with separate bass and treble controls – not to mention more power and an $87.50 price tag – got shipped with the “new” 150 panels. 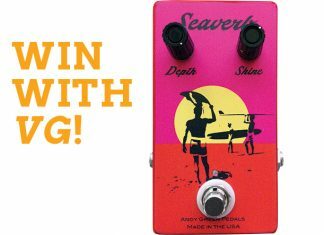 Were any of the combos fitted with the separate bass and treble controls? Annual catalogs and updates from ’39, ’40, ’41, and ’42 point against it, but anything’s possible. Who’s got one? While tone is subjective, many great players have had relationships with the Gibson EH-150, especially the 12″ model. The most famous and influential of these is the late, great Charlie Christian. While he is later pictured with the EH-185 and the short-lived deluxe maple cabinet EH-275, his early use of the 150 is well documented on classic recordings with the Benny Goodman Sextet. Even more important than these may be his after-hours jamming at Minton’s nightclub, in Harlem, where he was able to stretch and develop his ideas in a manner not possible with the Goodman band. Many feel the future of jazz guitar, and bebop in general, came out of these sessions. According to interviews in Peter Broadbent’s Charlie Christian: The Seminal Electric Guitarist, Minton’s manager, Teddy Hill, bought an EH-150 and a bar-pickup equipped ES-150 guitar (similar to the one from Christian’s early Goodman days) to keep at the club for his use (more on this later). Check out Charlie Christian – Live Sessions At Minton’s Playhouse on the Jazz Anthology label to hear why his playing and the sound of the ES-150 through an EH-150 amp continue to thrill and inspire listeners and players the world over, as they have since 1939. And while his playing surely could have transcended his equipment, the fact he used an EH-150 for a good portion of his career guarantees the model a place in the Vintage Guitar Amplifier Hall Of Fame. Special thanks to Experience Music Project, Peter Blecha, Roger Sadowsky, Ken Fallon and the gang at Sadowsky Guitars, Rod McDonald, Bill Victor, Thom and Kathy at Ross Music, Buck Sulcer, and Lynn Wheelwright. EH-150 guitar and Style 1 amp from first quarter of ’36. This article originally appeared in VG‘s Jul. ’99 issue.